OutKast is an American hip hop duo based in East Point, Georgia, consisting of Atlanta native André "André 3000" Benjamin (formerly known as Dré) and Savannah, Georgia-born Antwan "Big Boi" Patton. They were originally known as The OKB (The OutKast Brothers) but later changed the group's name to OutKast. The group's original musical style was a mixture of Dirty South and G-Funk. Since then, however, funk, soul, rock, electronic music, spoken word poetry, jazz, and blues elements have been added to the group's musical palette. The duo is one of the most successful hip-hop groups of all time, having received six Grammy Awards. 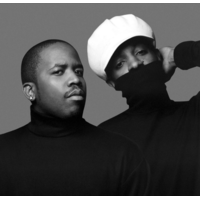 Over 25 million copies have been sold of OutKast's eight releases: five studio albums, a greatest hits release, and the Grammy Award-winning (for Best Album) Speakerboxxx/The Love Below, a double album containing a solo album from each member. Along with their commercial success, OutKast has maintained an experimental approach in their music and are widely praised for their originality and artistic content.